The harmful role Wall Street banks play in propping up fossil projects around the world is increasingly known. Yet, there is much less awareness of the role major cities play when they place billions of dollars of their public funds into these same Wall Street banks. According to L.A. city records, as of July 2018, Los Angeles had banking and/or investment relationships with several Wall Street banks, many of which are notorious for their financing of fossil fuel and human rights debacles around the world, including JP Morgan Chase, Citi, Bank of America and Wells Fargo. (1,2) According to Banking on Climate Change, a fossil fuel finance report card, between 2015 and 2017 these Wall Street banks collectively provided over $50 billion in financing for tar sands, ultra-deep water drilling, coal mining, coal power and liquid natural gas projects around the world. (3) These projects contribute vast amounts of greenhouse gases into the atmosphere, and many of them have severe local environmental, social and human rights impacts as well. But in 2018, cities have more ethical options. Rather than investing the public’s money in environmental and human destruction, cities can establish public banks. When properly structured and operated, public banks can prohibit the use of their funds for fossil fuel and other harmful projects. Instead, they can fund renewable energy and other green enterprises, affordable housing, education and low-cost loans to job-creating entrepreneurs — all while avoiding paying hundreds of millions of dollars in exorbitant fees to Wall Street banks. 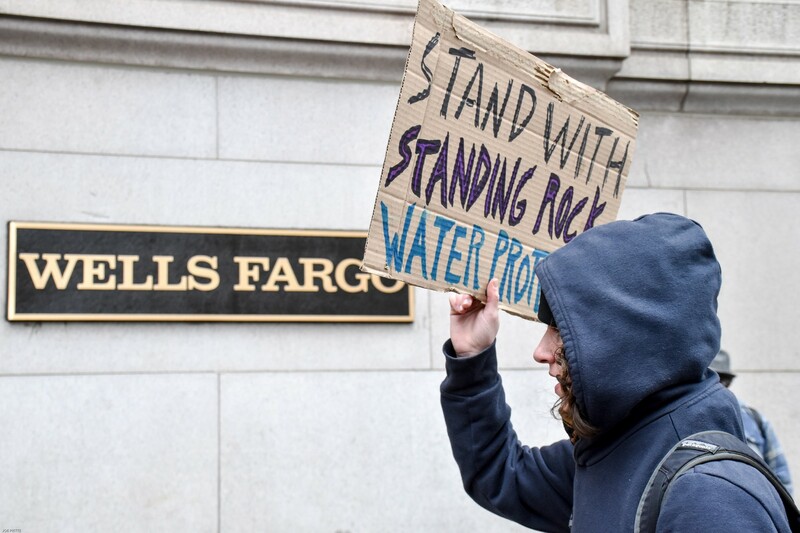 Activist calling for Wells Fargo to divest from Dakota Access Pipeline. Image via Creative Commons. If L.A. voters approve Charter Amendment B, the city will be one step closer to creating a municipal bank and redirecting its billions of dollars of public funds to environmentally sound, fiscally smart, sustainable community needs. In doing so, L.A. will serve as a beacon of progress to inspire the larger national movement to establish public banks. The proposed 600-mile Atlantic Coast Pipeline, running from West Virginia through North Carolina, is the third longest gas pipeline in production or in some phase of development over the past 20 years in the U.S. Trees have been cleared along the pipeline route and infrastructure development has begun. 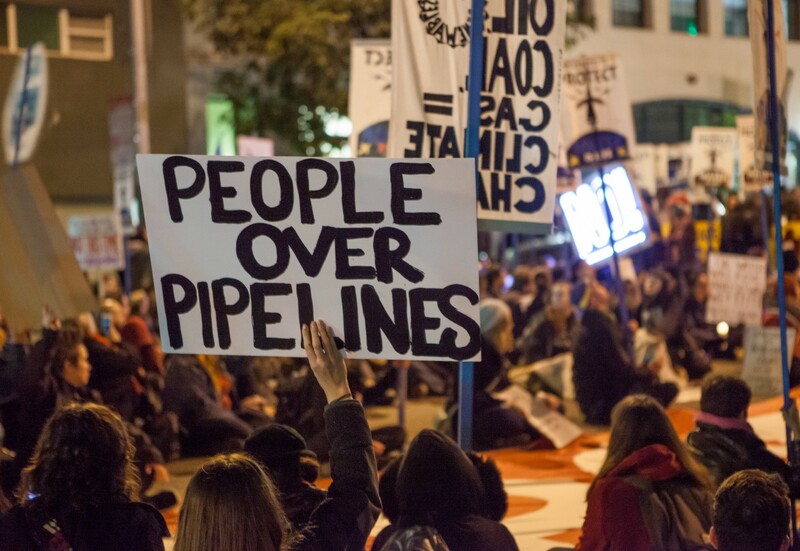 Although two lawsuits against the pipeline are now pending in federal and North Carolina courts, federal law allows pipelines to be constructed prior to the resolution of all litigation. The ACP was the only oil or gas pipeline to be on Donald Trump’s list of 50 Priority National Security Projects prior to his election. According to published reports, the central purpose of the ACP is to enter South Carolina and eventually reach Elba Island, Georgia where gas will be exported from a liquid natural gas facility now under construction. This recognition raises serious concerns regarding the use of eminent domain to take privately owned property for private gain instead of public use. Long Phu-1 in Vietnam would emit an estimated 6.3 million tonnes of CO2 per year. As a “supercritical” coal power plant, Long Phu-1 is prohibited from being financed by most official government export credit agencies (ECA), including the U.S. Export-Import Bank. (32)However, the former director of the EPA’s Air Enforcement Division, Bruce Buckheit, revealed that the project consulting firm Environmental Resources Management doctored the coal plant’s greenhouse gas emissions estimates to make Long Phu-1 appear to be a more efficient “ultra-supercritical” plant, which would be allowed under ECA coal financing restrictions. (33) Analysis of Long Phu-1 by Friends of the Earth U.S. reveals that the project violates other international policies, including requirements to analyze alternatives, identify cumulative and associated risks and impacts, evaluate labor and working conditions, prevent pollution, protect community health, provide safety and security, and ensure biodiversity conservation. (34)In February 2018, the New York Times reported that U.S. Export-Import Bank financing for Long Phu-1 had collapsed after it was revealed that project financiers included Vnesheconombank, a Russian bank that is on the U.S. government’s sanctions list and is part of a federal investigation into possible collusion between the Russian government and the Trump presidential campaign. It was also reported that a top Long Phu-1 project official had been sentenced to prison for corruption. (35) MUFG and JP Morgan Chase, like the U.S. Export-Import Bank, must also comply with U.S. sanctions. However, it remains unclear whether these banks continue to be potential financiers of Long Phu-1. Paid for by Friends of the Earth, 1101 15th St, NW, 11th FL, Washington, DC 20005. Additional information is available at ethics.lacity.org. See, inter alia, Related Dodgy Deals, Banks, BankTrack, available at https://www.banktrack.org/search#category=banks. Financial volumes provided may vary from that reflected in publicly available information. Opponents to Appeal Atlantic Coast Pipeline Construction, September 20, 2018, Charlotte Business Journal. Medupi, Kusile, and the Massive Cost/Time Overrun, Daily Maverick, July 7, 2016. SEC Charges Hitachi with FCPA Violations, Securities and Exchange Commission Press Release, September 28, 2015, available at https://www.sec.gov/news/pressrelease/2015-212.html. Smoke and Mirrors: Debunking the Doctored Numbers on Long Phu-1 Greenhouse Gas Emissions, Bruce Buckheit, June 2017. Failure to Comply: How Long Phu-1 Violates Funders’ Environmental and Social Policies, Friends of the Earth, June 2017. Vietnam Pulls Request for U.S. Help to Build a Coal-Fired Power Plant, New York Times, February 11, 2018.